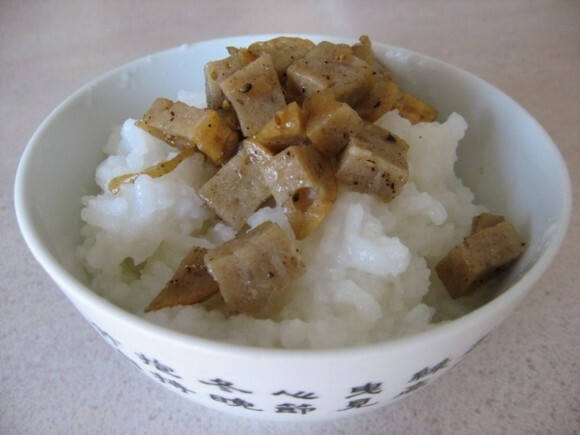 This simple porridge with braised sausage is commonly eaten for breakfast in Vietnamese households. Bring rice and water to a boil. Lower heat to medium and cook until the porridge is of the desired consistency. Cook longer for a thicker porridge. Dice cha into bite sized pieces and set aside. Slice shallots thinly and sauté until golden brown in a bit of vegetable oil. Add cha, nouc mam, sugar, salt, pepper, and a dash of water to the shallots over medium heat. Cook until all liquid has been absorbed. Serve with hot chao.